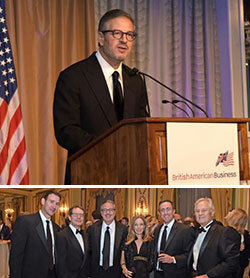 We are pleased to announce that BritishAmerican Business presented Tradeweb CEO, Lee Olesky with an Entrepreneurial Award at their annual Transatlantic Business Awards Dinner on October 13th. The evening celebrated great strides in innovation and shared successes for businesses bringing the U.S. and U.K. closer together. The award highlights Tradeweb’s entrepreneurial spirit and drive to navigate new challenges and deliver real innovation not only to clients, but across the fixed income and derivatives markets. In our dynamic industry, it’s special moments like these that allow us to pause and reflect on how far we’ve come, and what exciting opportunities lie ahead. As a firm, we remain committed to moving markets forward across the more than 25 markets we support through our offices in the U.S., Europe and Asia. We would like to thank our employees, clients and the industry for their continued support and for sharing in this gracious recognition. More details on the award can be found here.